Last Thursday, after a big detour of the Mapquest misdirection kind, I arrived in one piece at the Ramers’ home for my appointment. It was a fantastic visit starting with the warm greeting from Rev. Barbara Anne at her front door to me, the previously lost spinner. The well-lit room contained the most spinning wheels that I have ever seen much less beautiful antique spinning wheels. 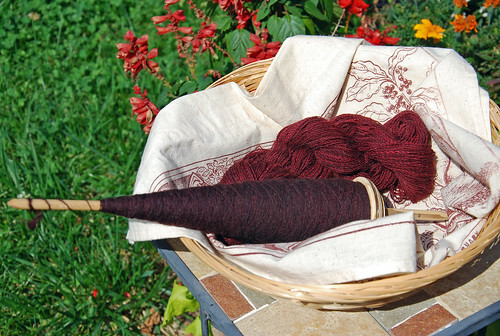 My friend was spot-on when she confirmed for me that the Ramer collection still had flax wheels! 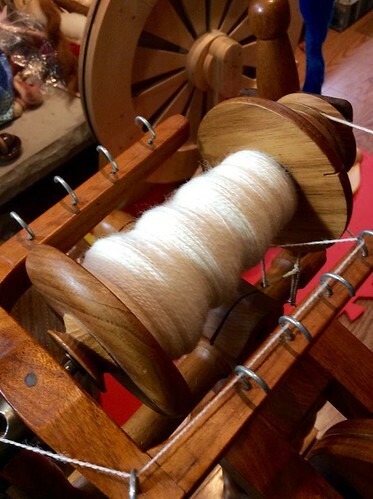 This is a smooth spinning wheel. 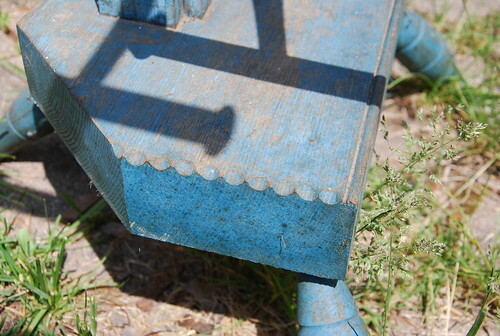 In taking this photo, I noticed the etched star motif on the back support of the treadle. It looks like simple lines from a penknife, and the rest of the wheel is elegantly turned and constructed. 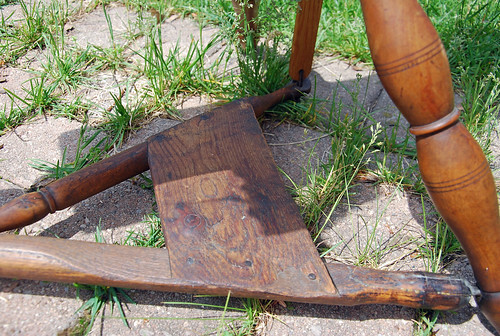 The feel of the broad, worn treadle is fantastic underfoot. 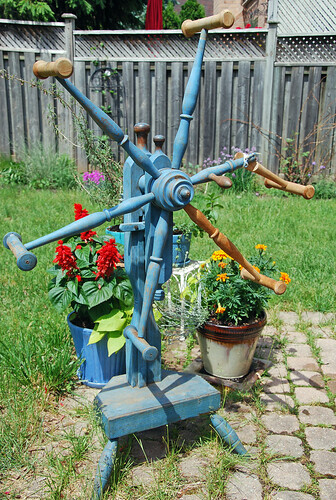 The drive wheel is 20 ¼” in diameter with 14 spokes in 4 rim segments. It has one wide rim groove and spins true. 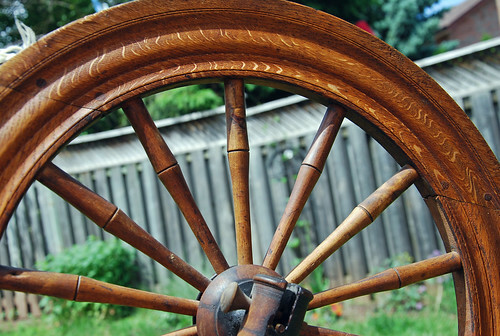 The heft of this hardwood drive wheel is exactly what I was hoping for in a flax wheel. In comparison, my P. Cadorette CPW has a 29 ½” wheel diameter. 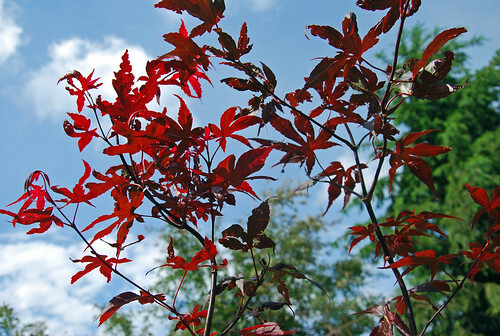 We know from her makers mark that she was made by a Scottish settler in New Glasgow, Nova Scotia in the 1820s – 1830s. The presumed maker is William McDonald as identified in the catalogue sheets by Keith MacGillivary. In searching, I discovered that Mr. Ramer’s Nova Scotia wheels were featured in the July 2004 issue of Spinning Wheel Sleuth magazine. I would love a copy of this issue! The sheet simply says that it was purchased in August 2001 from Tatamagouche, Nova Scotia. 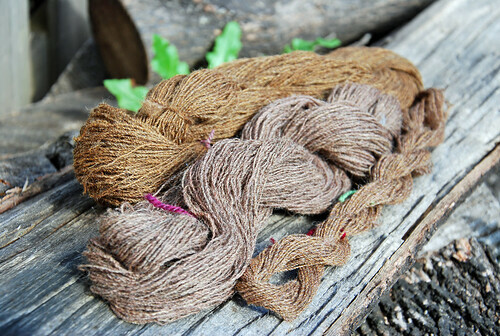 One frustration in spinning flax on my small Eastern European flax wheel has been its large orifice. This wheel controls the fine single, and I was thrilled to see the fluting on the inside of the orifice. 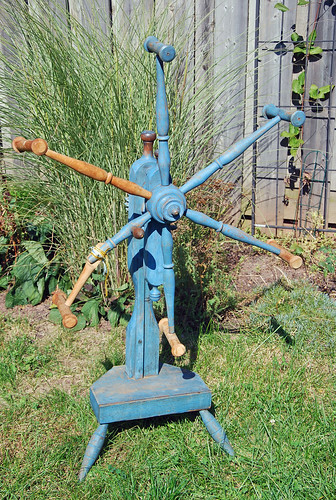 That screw-tension double drive wheels were even being made by several wheelwrights in Nova Scotia in this period is remarkable. 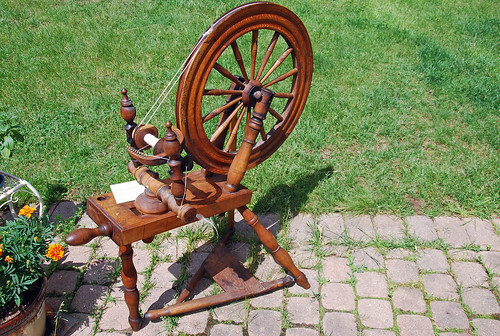 The report, “Selected Canadian Spinning Wheels in Perspective: an Analytical Approach” says that the 1759 expulsion of the Acadians from Atlantic Canada, “curtailed most of the early spinning traditions of Prince Edward Island and Nova Scotia…” (p. 265). Ontario was not producing any wheels of this type at the time (ibid, p. 275). This wheel must have stayed in Nova Scotia until the turn of this century. 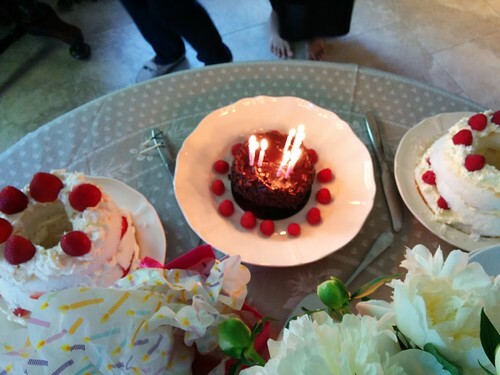 Now nearing 200 years of age she is restored, oiled, and in another immigrant spinner’s home. The vertical reel stood out among her peers from across the room. 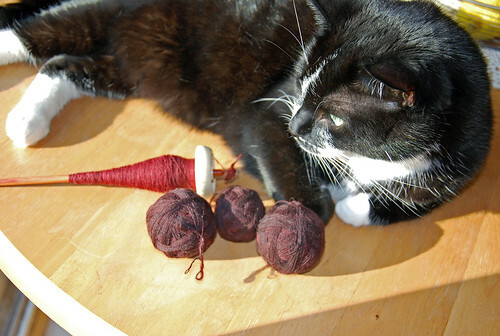 It is all 1 piece with a handle for winding the yarn. 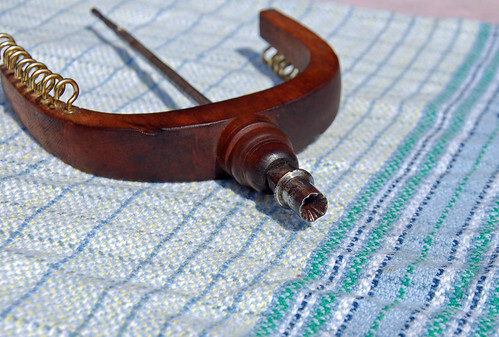 The wound skein is removed by bending the knee of the one jointed windmill arm. 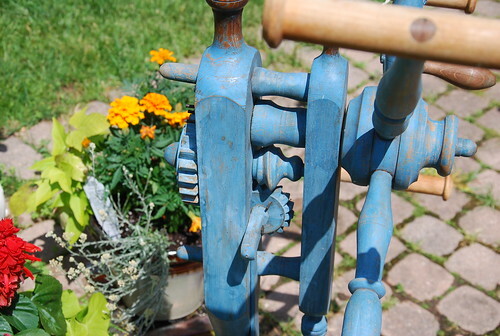 Behind her pretty front blue skirt is the also-painted wood gear and worm mechanism. 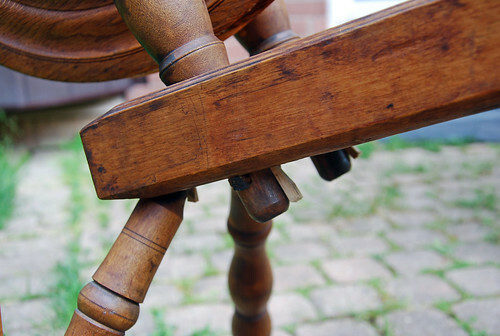 Once the metal pin on the small lower gear rotates fully, it slaps a long piece of thin wood & pop! I jump every time. 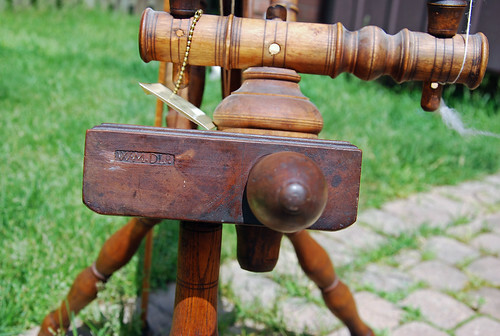 As if this is not enough excitement for one humble tool, her tripod platform has even pie-crust chip carving and a front bead. Also overflowing with excitement was me last week! The sale has been precipitated by family issues for the Ramers. I was very happy to meet Alvin, Barbara Anne, and their friend, Rosemary. It is a big transition but Barbara Anne asked me to let spinners know that Alvin wants to resume his wheel repair work as soon as possible. 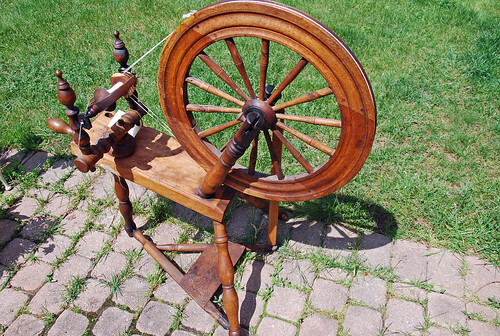 My hopes for the awesome circa 1820s Atlantic Canada wheel are simple – I want to spin flax. These are more than tools for that goal though. 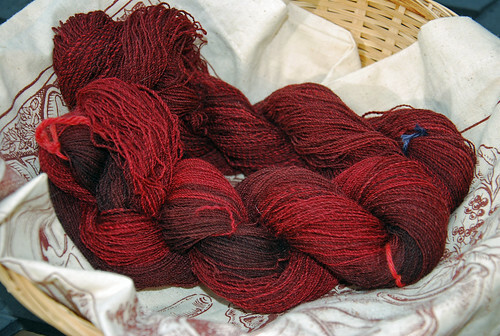 They come in my 5th year as a spinner, my 1st year as a weaver, and shortly after becoming Canadian. 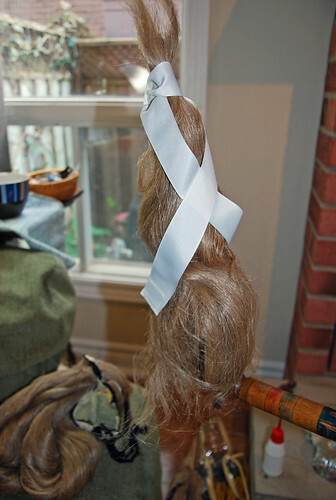 I am honoured to have such well restored artifacts to work with, and the good wishes of an expert flax spinner, Rev. Barbara Anne Ramer. 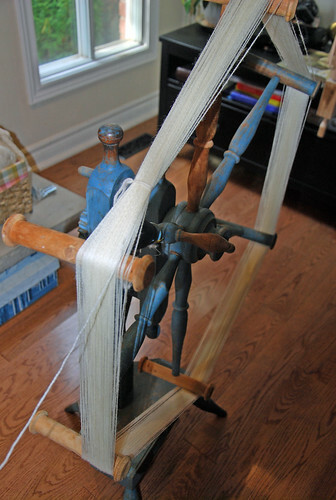 Categories: Good Gnus, Spinning, What I'm up to | Tags: Antique spinning wheel, click reel, Equipment, Flax, Nova Scotia spinning wheel | Permalink.